This CellML runs in both OpenCell and COR. It is the unscaled version of the model, taken from equations 16-25 in the original paper. There are no published results (figures) for the unscaled model therefore we do not know whether or not this CellML model is capable of reproducing the orignal model's results. 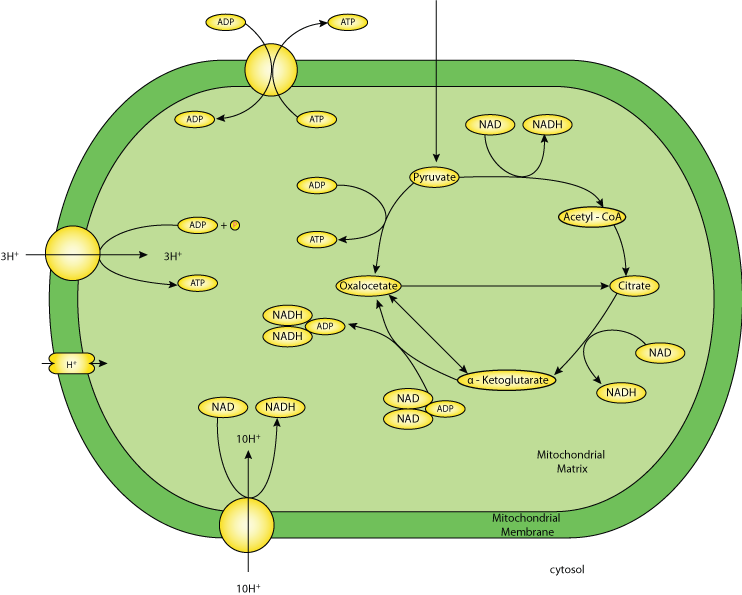 ABSTRACT: Mitochondria play a central role in cellular energetic metabolism. The essential parts of this metabolism are the tricarboxylic acid (TCA) cycle, the respiratory chain and the adenosine triphosphate (ATP) synthesis machinery. Here a simplified model of these three metabolic components with a limited set of differential equations is presented. The existence of a steady state is demonstrated and results of numerical simulations are presented. The relevance of a simple model to represent actual in vivo behavior is discussed. Schematic diagram of the model. Derived from workspace Nazaret, Heiske, Thurley and Mazat, 2009 at changeset 6a7504ae789b.